You’ll become a better beekeeper with ongoing education, and BEEport gives you additional motivation. Each year as a fundraiser, the Kalamazoo Bee Club raffles prizes often worth hundreds of dollars. Completing this passport to learning will grant you free raffle tickets at next year’s bee school, but better yet, encourage you to participate in various activities that will help you help bees. Outlined bee-low is how you get “stung”. With five stings, you’ll get $20 in raffle tickets at next year’s school. Collect all eight for an additional $5 in free tickets. BEEport forms are generally available at club events, or you can download a BEEport form here and print it yourself. Please bring your BEEport to all club activities, and look for the designated person to both collect your signature on the sign-in sheet, and initial your card. This is the first time for this program; things will surely evolve as it plays out. We’d appreciate your suggestions (and patience!) Direct BEEport communications and questions to BeeportKBC@gmail.com. If you don’t get a response within a month (the account won’t be monitored too closely if it is swarm season), please bug (or bee?) us again. We want to help you learn more about bees, and win a great raffle prize as you engage in the life-long learning that beekeeping demands. The BEEport is per individual, and the BEEport and stings are not transferable. Only one BEEport may be redeemed per person, per year. BEEport owner is responsible for providing proof of attendance at events in order to earn a sting. Only one sting per category. Stings are valid only for the next Kalamazoo Bee School—they cannot be carried over year-to-year. 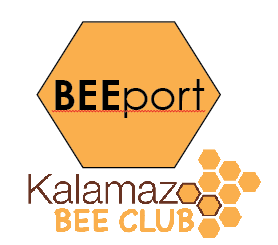 You must be enrolled in Kalamazoo Bee Club’s Bee School (when the time comes) to redeem BEEport rewards. At Kalamazoo Bee Club meetings—sign in AND see the designated KBC member to have your BEEport stung. At Apiary Days—sign in AND have the apiary manager or designee sting your card. For the MBA meeting stings—email receipt of attendance, or a photo of you at the event(s). Speaking on BEEhalf—email some sort of proof … maybe a photo of that preschool group learning that bees are our friends? At KVCC Beekeeping classes—have an instructor sting your BEEport. As a KBC volunteer—have the volunteer coordinator sting your BEEport. Any other activities? Chances are, it’ll earn a sting in the “Other activity supporting pollinators” category. Possibilities include attending another bee club or educational seminar, planting a garden, making a charitable contribution (like to the Kalamazoo Bee Club? ), or reviewing all the inaccuracies in Jerry Seinfeld’s “Bee Movie” with kids.